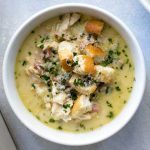 Cozy chicken cordon bleu soup made with tender chicken, ham, and plenty of cheese with easy homemade croutons on top! In a large bowl, whisk the oil with the salt and oregano. Add the diced bread to the bowl and, using your hands, toss them with the oil and seasonings until they are evenly coated. Spread the bread cubes in an even layer on a baking sheet. Bake them for ten minutes or until they are lightly toasted. Set the croutons aside while you make the soup. In a deep 12-inch skillet, heat the olive oil over medium heat. While you wait for the oil to heat, pound the chicken breast into an even thickness. Season both sides with kosher salt. Cook the chicken on both sides until it’s browned on the outside and cooked through. Transfer the chicken to a cutting board. In the same pan, melt the butter over medium heat. Add the ham, onion, and garlic. Cook them in the butter for about five minutes or until the onion softens. Add the wine and stir while it bubbles up. After a minute or so, sprinkle the flour over the top of the onions and ham. Stir to coat it all in the flour. Add the chicken stock and stir. Turn the heat up to high and once the soup is boiling, reduce the heat to maintain a simmer. Simmer the soup, stirring occasionally, for ten minutes. While the soup simmers, cut the chicken into bite-sized pieces (or you can shred it). Add it to the soup once it’s simmered for ten minutes. Add the milk and stir. Bring the soup back to a gentle simmer. Add all of the cheese and stir again until the cheese has melted into the soup. Add the chopped parsley and stir. To serve, ladle the soup into bowls. Top each bowl of soup with some croutons and the garnishes, if using. Look for 8-ounce packages of diced ham in the deli department. I used a Pinot Grigio for this recipe, but you can also use Chardonnay, Sauvignon blanc, or other dry white wine. You don’t have to use expensive wine – choose a wine that you like to drink! I used regular chicken stock for this recipe. Depending on the brand you may need to add salt to the soup, especially if you use low-sodium chicken stock. Give the soup a taste before you serve it and adjust the seasoning if needed.